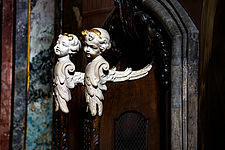 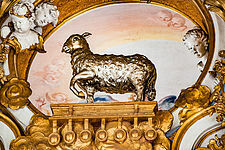 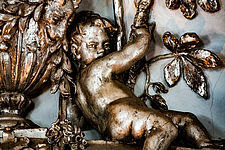 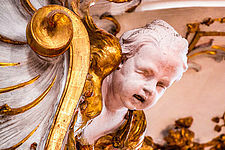 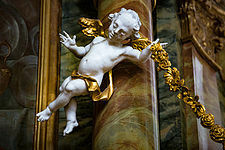 For this series, I photographed in Germany details of ornamentation found in Rococo churches and palace structures. All of the ornamentation was created between the 1720s and 1760s, yet these details have, I feel, an eerie contemporary sensibility that speaks to our troubled times. 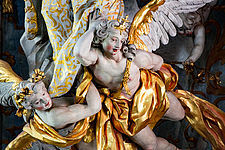 Many of the details are from Bavarian Rococo churches, some of the world’s most celebrated and theatrical examples of church architecture. 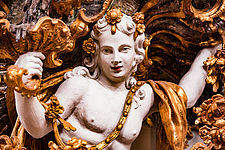 While in the service of the divine, these details are decidedly more reflective of the human than the divine--they are made not of marble but of a more humble material, painted plaster, with gilding that accentuates artificiality; and the faces express not serenity but alienation and a tortured psychology.